Note: this thread will be moved to the new Uncharted Territory forum when it eventually appears. With our only info on X and Y coming from a select few individuals, we're still mostly in the dark on 6th generation battle mechanics. To help speed along research, we're preparing a list of things that should be tested when the games do come out. This list is mostly speculative, mostly consisting of possible nerfs, glitch fixes, or other changes made to accommodate new mechanics. We are now accepting suggestions for the list from the public. Do NOT discuss competitive implications for the new changes. Do NOT discuss the new training methods. That will be handled in a separate thread. Do NOT discuss type changes to existing Pokémon. That is already handled in another thread. 2. Avoid vague questions like "does X still work the same?" or "How does new move Y work?" We need a specific idea to test. Other guidelines will probably be added at the discretion of the moderators soon enough. Sheer Force: does it no longer negate Life Orb recoil\Eject Button activation\etc? Cursed Body: changed to affect only contact moves? Quick Guard: does it still not block moves given priority by Prankster? Analytic: Does it still boost damage against a target switching in? Auto-weather abilities: Does the weather counter reset to 5-8 if the Pokémon is switched in while the appropriate weather (rain for Drizzle, etc.) is already in effect? Mean Look\Baton Pass: Does Baton Pass pass on the trapping effect once again, or does the effect still wear off? Rumor: Play Nice ignores Protect. Now that the damage of partial trapping moves is increased to 1/8th total HP per turn, how has that damage with Binding Band changed? It's known that Mega-Evolution occurs before any moves, but what is not clear is if it occurs before or after switching is handled. Known info: if a Pokémon is weak to one type but resistant to the other, it takes 1x damage. Known info: if a Pokémon is immune to one of the listed types, it is immune to the move entirely. Flying Press mentions the Flying-type in the move description, but lists Fighting-type on the status screen. If a Flying- but not Fighting-type uses it, does it still get STAB? What type-boosting items work for dual-type moves? The type listed on the screen, and\or the one in the move description? How does Conversion2 interact with them? Does it use the main type listed on the move info page, or both types? Dual type moves: What happens if the target is immune to one of the types, either through type immunity or ability immunity, but not the other? Does it take damage, or does the ability activate? Freeze Dry: is it still super-effective against Water-types whose other type also resists Ice? Is it blocked by Water Absorb\Storm Drain? Topsy-Turvy: is it affected by Clear Body? Parting Shot: does it still work against Magic Bounce? Parental Bond: if Kangaskhan uses Helping Hand twice because of Parental Bond, is the boost increased? Weakness Policy: is it used up when the Pokémon is hit by a super-effective move, or does the item remain? Electric immunity to paralysis: when an Electric-type with Volt Absorb\Lightningrod gets hit by Thunder Wave, which takes precedence? If paralysis immunity takes precedence, then the the healing\Sp. Attk boost will not occur. Honedge line and Magnet Pull: are they still affected despite the Ghost immunity to trapping abilities? Pokémon-Amie: does it have any effect on link battles? Abilities such as Intimidate and Drought activate if the Pokémon gains them through Mega-Evolution. Overcoat now protects from powder-based moves as well as weather, giving it an identical effect to the item Safety Goggles. Critical hits now deal 1.5x damage, instead of 2x as in the previous 5 generations. One thing I'd like checked out is the new Ghost STAB. Does it allow switch-out from Partial trapping moves? Are Ghost types still damaged by those moves? Are Ghost types immune from Shadow Tag or Arena Trap? Can you take the megastone from a pokemon with moves like Trick or Thief? Does Magic Room prevent mega-evolution from occuring? Has Explosion/ Selfdestruct reverted to pre-Gen V effect? 1: Do the non-Wi-Fi using link battle modes still not use team preview like gen 5? 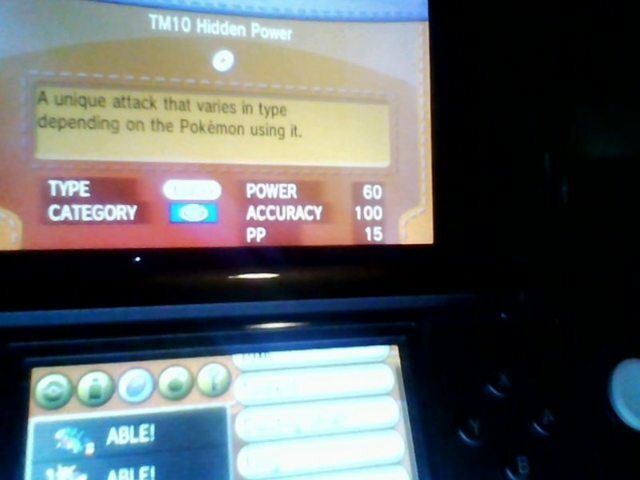 2: Can the Wi-Fi link battle modes chose not to use it or are they still forced to have it like gen 5? 3: In modes using Team Preview are we still allowed to alter team order as in gen 5? Is it a dual-type move? When will it hit super-effectively? What will happen if it hits, say, Walrein? Are Dream World/Hidden abilities still passed by the female parent only? Does Ditto still prevent Dream World/Hidden ability inheritance from occuring? Does Mold Breaker still ignore Telepathy in doubles/triples battles? What priority bracket are Mega Evolutions? Do they occur before switching? If two Pokemon Mega Evolve at the same time (opposite teams of course) which Mega Evolves first? I'll add the bit for partial trapping moves. Ghost types are already known to be immune to Shadow Tag. Mega-Evolution questions are good, added. I didn't add Explosion\Sefldestruct because I don't expect them to change it back - this was actually a good nerf for doubles. It was also a reasonable nerf for Encore. I don't expect this to change (except for maybe the non-WiFi modes). It's probably not a dual-type move unless there's an indication it's super-effective against other types. But the Walrein question is a good one. 1. Let's stick to battle mechanics for now. 2. Mold Breaker being an ability that ignores abilities, I don't expect this to change. 3. If there's an indication that stat resets occur from mega-evolution, we'll add that. 4. It's known that mega-evolution happens before any moves. However, whether it occurs before or after switching occurs is unclear. Added. Does Misty Terrain really nerf dragon moves? How does the relationship between the normal way of getting EVs and super training affect EV training? Do you still get EVs the normal way? Any offensive moves changed to fairy? Does Embargo inhibit Mega Evolution? Where exactly does Mega Evolution's priority fall? The move description for Misty Terrain (screenshot) says nothing about Dragon moves. Or even damaging moves. According to the description, it prevents status conditions, ostensibly like Safeguard. We won't be discussing training\breeding changes here. Type changes are already discussed in other threads as well. Binding Band question is new, added. Can Mega-Evolution be prevented by preemptively removing the item from the Pokémon through Knock Off or Trick? Permutation of this: If a Mega Stone can be removed by Trick or Switcheroo, can it be removed after Mega Evolution has occured? IE: Trick/Switcheroo a Choice item onto a Mega Evolved Pokemon. Do weather summon abilities work the same? What about Cloud Nine/Air Lock? What are the effects of Electric Field? Does it activate Volt Absorb, Lightningrod and Motor Drive every turn or just once? What are the effects of Grass Field? Does Evolite work on a pokemon with a Mega Evolution? Does Stealth Rock work the same? Comprehensive list of TMs and HMs? Is there any change to how Hidden Power type and base power is calculated? This thread is about battle mechanics, not Pokemon\movepool info. The other questions do not make good research questions, as they do not mention a specific idea to test. For example, a better worded question would be "does Stealth Rock still deal 50% damage to Pokémon who are 4x weak to Rock?" Note that we are looking for likely changes, so not every research idea is going into the first post. Does the Sky drop glitch still occur? Is Honedge and family affected by Magnet Pull? What are the effects of Light ray on Ground, Sap Sipper or Volt Absorb Pokemon? 1. Good question. Thought about it myself but forgot. 2. Already in the first post. 4. Added, rephrased to apply to all dual-type moves. Magic Guard: Does this ability still prevent Life Orb damage? Can a Pokemon mega evolve when statused? (particularly, Sleep and Freeze). Can a Pokemon mega evolve and switch out on the same turn? If your megamon faints, can you megaevolve another one? Does Forest Curse / Trick-or-Treat affect dual typed Pokemon? If Aegislash switches out, does it revert to its shield stance? Does Mega Evolution reset status changes? Are hidden abilities accessible though an item? Imposter / Illusion: how do they work with/against Mega Evolved Pokemon? Does it take up the evolved or unevolved form? Cute Charm: could it have been buffed into a defensive Rivalry or otherwise as speculated in the XY thread? Trick Room: Does a Pokemon with more than the speed limit still move first? Weather: still the same mechanics as BW? Color Change: what happens if hit by a Dual-type move? Does it take both types or one of them (and which) or does it not activate at all. Does Mega Evolution have any effect on pre-existing stat drops/buffs? For example, if a Lucario is at -1 Def and Mega Evolves while still having this stat drop, does its Defense go back to +/- 0? I know it is said to affect the Pokemon in some way, but how? Will it be implemented? How will it work? The "Electric Field", what other changes does it make? If it gets priority, won't it be one of the most OP moves ever? How is this gonna work? What about something like Shedinja, will it be affected by one or the other? And what others will we see? Isn't it going to be the best Support pokemon ever? With MIsty Terrain, Baby-Doll eyes, and an awesome typing? Its priority attack, Baby-Doll Eyes (Learned by Sylveon as well), will make it near unstoppable on the Physcial side, how will it not be unstoppable? According to the same link that says Shadow Tag doesn't effect Ghost-types, it also mentions many special-type moves are getting revamped in power and accuracy, probably because of new moves being introduced. Lots of moves will need to be looked at, even if it is just grunt work I feel it's worthy of the research. Noted in Clawitzers' ability, we have new classifications of moves in Aura and Pulse moves. What moves are Aura or Pulse moves? Do these moves have any other effects besides being effected by abilities? Interested in a full list of all powder and spore moves that grass types are unaffected by. I'm sure GameFreak will pull a fast one and throw one in that doesn't have spore or powder in its name. To add onto Special Moves, the Pledge moves have been confirmed to be 80 BP now, making them a lot more useful. We should check as soon as possible to see whether Analytic still boosts move power on the switch.